improves your mental and physical well-being, increases flexibility, and strengthens muscles. Pilates uses controlled movements in the form of mat exercises or equipment to tone and strengthen the body. The "powerhouse" - abdomen, lower back, and buttocks - is supported and strengthened, enabling the rest of the body to move free. Please arrive at least 5 minutes before the class begins to fill out an information form needed by the teacher prior to your first class. All information will remain confidential and used only for TONE private use. It is recommended that participants wear close-fitting clothing to allow for the most efficient movement and teaching (T-shirts and baggy pants are not useful). Outdoor shoes are not allowed in the studios. Socks with sticky soles however are recommended and a towel is advised. Socks required for all equipment classes. The keys to success in any exercise program are commitment and consistency. We recommend two to three times a week. 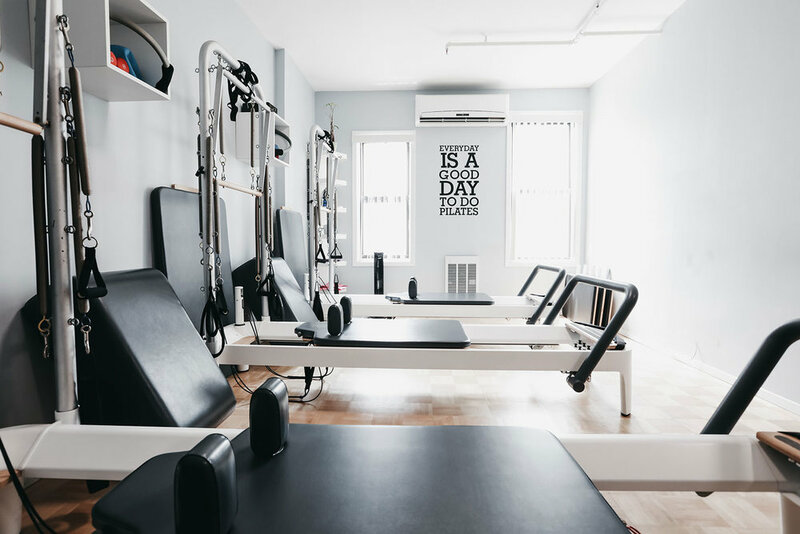 Reformer classes - the studio provides all necessary equipment. If you are attending mat classes, please bring a mat. If you forget to bring a mat, you can rent one for $2. Water is available for purchase.